This past Saturday I had the opportunity to work with a truly lovely group of ladies. We gathered at Wayside Presbyterian Church in Hamburg, NY. 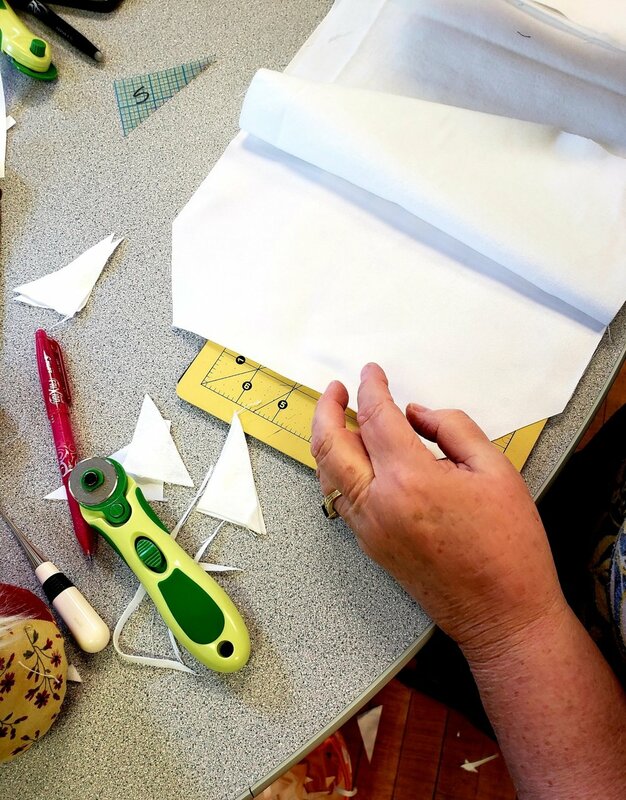 We brought our sewing machines, rotary cutters, ribbons, and supplies needed to cut, sew, and create small drawstring jewelry bags, angel pouches, and weighted butterfly pillows. Ladies also created crocheted and knitted blankets, sweaters, booties, and tiny caps for infants. To create these projects, we use stunning wedding gowns, generously donated by women within our area. Beaded lace, satin and silk, sequins, and pearls decorate these gorgeous gowns. Next, we carefully consider which gowns are best suited for each project. The small drawstring jewelry bags will hold cremation necklaces given to mothers as a keepsake of their infant. The angel pouches are used to hold an urn, teddy bear, or any other memorial item that will be presented to a family. The weighted butterflies can be warmed in a microwave and placed on a parent’s chest or stomach or simply held in a mother’s aching arms. The butterflies are made with an extremely soft fabric called minky. After the fabric butterfly shapes are stitched together, we fill them with rice. Next, we begin cutting and sewing. All ages come together to work on these special projects, from Annabelle, who is eleven years old, to ladies in their seventies! We learn from one another, share stories, and enjoy great fellowship. Some stories are shared, that years ago may have been brushed under the rug, about a miscarriage or the passing of an infant. This is a place where we can share and support one another and of course sew these precious gifts. If you are interested in starting an outreach program similar to this, please contact me by email at Elizabethcecchettini@gmail.com. You will be providing a service that will assist your community and the needs of people facing perinatal death, the death of a baby from miscarriage, ectopic pregnancy, stillbirth or early infant death.